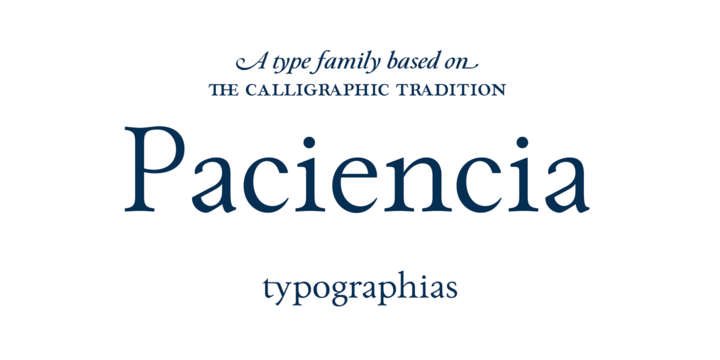 Paciencia is a typeface created by Thiago Oliveira and published by Typographias which is based on callygraphic sketches. It was produced during 8 years and is available in 4 weights (Regular, Medium, Bold, Black) and italics with enough goods. With a humanistic touch it is perfect for your caligraphic projects, such as invitation, signage, wedding, headline and so on. Have fun! Price: starting from $28,00 for one font to $140,00 for all 8 fonts. A font description published on Wednesday, January 31st, 2018 in Fonts, Thiago Oliveira, Typographias by Alexandra that has 1,126 views.